The positions and reconstructed orbits of 20 high-velocity stars, represented on top of an artistic view of our Galaxy, the Milky Way. These stars were identified using data from the second release of ESA's Gaia mission. The seven stars shown in red are sprinting away from the Galaxy and could be travelling fast enough to eventually escape its gravity. Surprisingly, the study revealed also thirteen stars, shown in orange, that are racing towards the Milky Way: these could be stars from another galaxy, zooming right through our own. A team of astronomers using the latest set of data from ESA's Gaia mission to look for high-velocity stars being kicked out of the Milky Way were surprised to find stars instead sprinting inwards -- perhaps from another galaxy. The study is published in the journal Monthly Notices of the Royal Astronomical Society. Stars circle around our galaxy at hundreds of kilometres per second, and their motions contain a wealth of information about the past history of the Galaxy. The fastest class of these stars are called hypervelocity stars, which are thought to start their life near the Galactic centre, later to be flung towards the edge of the Milky Way via interactions with the black hole at its centre. Only a small number of hypervelocity stars have ever been discovered, and Gaia's recently published second data release provides a unique opportunity to look for more of them. "Of the seven million Gaia stars with full 3D velocity measurements, we found twenty that could be travelling fast enough to eventually escape from the Milky Way," explains Elena Maria Rossi, one of the authors of the new study, based at Leiden University, in the Netherlands. However, the team were in for a surprise: "Rather than flying away from the Galactic centre, most of the high-velocity stars we spotted seem to be racing towards it," adds co-author Tommaso Marchetti. "These could be stars from another galaxy, zooming right through the Milky Way." It is possible that these intergalactic interlopers come from the Large Magellanic Cloud, a relatively small galaxy orbiting the Milky Way, or they may originate from a galaxy even further afield. If that is the case, they carry the imprint of their site of origin, and studying them at much closer distances than their parent galaxy could provide unprecedented information on the nature of stars in another galaxy -- similar in a way to studying Martian material brought to our planet by meteorites. "Stars can be accelerated to high velocities when they interact with a supermassive black hole," Elena explains. "So the presence of these stars might be a sign of such black holes in nearby galaxies. But the stars may also have once been part of a binary system, flung towards the Milky Way when their companion star exploded as a supernova. Either way, studying them could tell us more about these kinds of processes in nearby galaxies." An alternative explanation is that the newly identified sprinting stars could be native to our Galaxy's halo, accelerated and pushed inwards through interactions with one of the dwarf galaxies that fell towards the Milky Way during its build-up history. Additional information about the age and composition of the stars could help the astronomers clarify their origin. New data will help to nail down the nature and origin of these stars with more certainty, and the team will use ground-based telescopes to find out more about them. At least two more Gaia data releases are planned in the 2020s, and each will provide both more precise and new information on a larger set of stars. "We eventually expect full 3D velocity measurements for up to 150 million stars," explains co-author Anthony Brown, chair of the Gaia Data Processing and Analysis Consortium Executive. 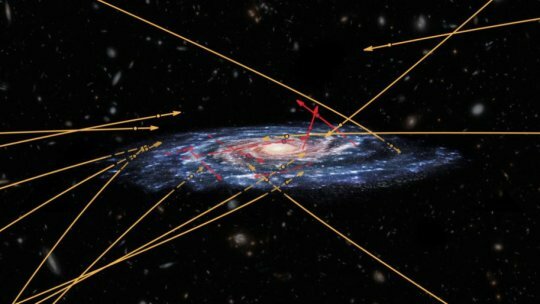 "This will help find hundreds or thousands of hypervelocity stars, understand their origin in much more detail, and use them to investigate the Galactic centre environment as well as the history of our Galaxy," he adds. "This exciting result shows that Gaia is a true discovery machine, providing the ground for completely unexpected discoveries about our Galaxy," concludes Timo Prusti, Gaia project scientist at ESA.